In German cuisine, there is no ‘pie’ as such. The closest you can get is torte. Strudel is very much like pie, as it contains both pastry and fruit filling. Further, apple strudel is the centre of the universe when it comes to German cuisine. So, in the spirit of the late, great Carl Sagan, allow me to present this homage to a childhood memory drenched in the popular German epicurean delight: Strudel. …a very young girl, with a Mother who works full time. A working Mother was unusual in the German community that I grew up in. My Grandfather had been a pastor at a German Baptist church in Toronto, so I knew just about everyone in the congregation. I knew no other Mother who worked outside the home. There were senior women from the church who would volunteer their time to visit young households and show the novice housewives how to prepare an apple strudel from scratch. No doubt, the thought that there were German homes with children who never had fresh apple strudel must have been unthinkable to these women who donated their time, patience and baking expertise. On the designated day, Oma Haas would show up at our home very early in the morning. The first order of of the day would be would begin with the peeling of apples. It seemed as Mother and Oma Haas were peeling apples for hours. There must have been a whole bushel involved. All you could smell was apples. As soon as they were peeled the naked apples would be given a bath in a large bowl filled with lemon juice and water to help preserve freshness as it would be quite awhile before they made it into the oven. There was still so much work to be done. After the apples were peeled, bathed and dried, they were then finely sliced and chopped. There were mounds and mounds of apples. It was as if our home had been invaded by them. The next thing I remember is the preparation of the dough. It took a lot of flour, elbow grease and kneading to make this dough perfect. Oma Haas would accept nothing less. After it had been prepared a large clean white cloth was placed over the kitchen table. Next the dough was rolled out, and rolled and rolled. Meticulous fingers were used to prod and coax the dough until it covered the entire table and hung over the sides. Any rips or holes were carefully mended. At this point the dough was so thin that you could almost see through it. Then it was carefully brushed with butter so it wouldn’t dry out too quickly. Even at my age, I was impressed at the precision Oma Haas displayed in her work. She knew exactly what to do and when to do it. Mother didn’t dare second guess her. She followed orders and did as she was told. There was little conversation as Mother and Oma Haas worked, as there was a whole lot of concentration going on. The apples were then strewn across the table along with sugar, cinnamon and raisins. At this point, it looked like my Mother and Oma Haas were having lots of fun. However, I was strictly verboten from touching anything. Still, I snuck a piece of apple whenever I could. Then came the most interesting part. One side of the white tablecloth was lifted high and manipulated in a waving motion so that the dough rolled up all by itself without being touched by hand. It made for a very long apple jelly roll. When rolling was completed, the strudel was cut into pieces to fit into the baking pans. There was lots and lots of strudel to bake, so it could not go into the oven all at once. I remember the final strudel came out of the oven late in the afternoon. Then it was time to clean the kitchen. By the time it was all over, we had a fridge full of strudel. Oma Haas took some strudel to share with her family and other members of the church congregation. Those were different times indeed. There was no canned apple filling, no phyllo dough, no store bought apple strudel. …As well as the love for a good homemade apple strudel. It was a chorale of singers who along with their music conductor, Mitch, sang popular ballads and folk songs. Viewers would be encouraged to sing along. The words to the songs scrolled along the bottom of the television screen along with the obligatory bouncing ball. I was very young at the time, and never got a chance to sing along with Mitch. After four years, I think that it’s safe to say that the television series, TWO GREEDY ITALIANS remains my family’s favourite cooking show. Since it’s debut on BBC television on May 2011, there have been many cookbooks, and even a second season called TWO GREEDY ITALIANS: STILL HUNGRY. 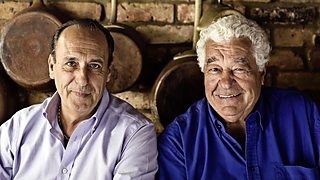 In the series premier episode, we were introduced to well known chefs Gennaro Contaldo and Antonio Carluccio, who were both born in Italy. They both left Italy when they were young adults to travel abroad and persue their careers. To show how simple these dishes were to prepare, the chefs often sat outside from where they were lodging, lit a fire and prepared their meal. It was through their inspiration that one weekend I resolved to try and cook a real Italian dinner. The dishes I chose were ricotta dumplings, (gnocchi), and warm chocolate and amaretto pudding. I had heard of gnocchi all my life but had never tried it. As for the warm chocolate and amaretto pudding, who wouldn’t be able to resist that? Both dishes were an easy success which led me to try two more of their dishes the following weekend. The dishes I chose to make next were the slow cooked family stew and polenta. The stew called for juniper berries which I was unable to find. Instead, I was told that a bay leaf would suffice. Never before had I experienced such a rich tasting stew. As for the polenta, it reminded me of the cream of wheat I had as a child. The interesting twist to this dish was the ingredient, Fontana cheese. This was delicious as well. The following weekend, it was my husbands’ turn to cook. For his dish, he did not look to the Greedies, but rather a dish he had heard of and wanted to try, spaghetti carbonara. Never before, had I seen him as meticulous as he was with the ingredients. His hard work and determination paid off, because again, the meal was a success. These are not meals that one can enjoy everyday, as they are rich and somewhat expensive to prepare. Our first trip to Italy changed how our family shopped for groceries, how we prepared our food and how we ate. During our time in Italy, I paid close attention to the salad ingredients. Once I returned home, I was pleasantly surprised how many of the ingredients were available. In fact, I remember always seeing these vegetables in the produce aisles in the supermarket, I just didn’t know what they were. Here is a rundown of ingredients you might want to include in your next salad. I would encourage you to switch your bottled dressing to a tablespoon of olive oil, and a few sprinkles of balsamic vinaigrette. Remember, olive oil is good for you. I read one report that said anyone can substantially reduce their chances for macular degeneration, a degenerative disorder of the eye, by including one tablespoon of olive oil, a handful of nuts plus lots of green leafy vegetables in their diet each day, along with two servings of fish each week. I was curious about how I would know a good bottle of balsamic vinaigrette when I saw one. Then, one day, I was in a Costco, of all places where a nice lady was giving out samples of this tasty fare. She had three different types, from the least to most expensive. After trying a spoon of all three, I finally figured it out. What a difference. The preferred and of course most expensive balsamic vinaigrette is syrupy and sweet. It was a good lesson for me. I hope you have this same opportunity. It cost me forty dollars for a bottle, but lasted six months. Next time you find yourself at the grocery store, treat yourself to some fresh mozzarella. This comes in many shapes and sizes. My favourite is Bocconchini. I like to toss it into the salad. For the final touch, sprinkle on some freshly grated Parmesan cheese, and fresh ground pepper. Feel free to experiment with other ingredients till you find what suits you best. I like the combination above, because it is so fragrant and flavourful, I could close my eyes and easily imagine that I’m in a Roman ristorante. …make that two bowls of my Mother’s corned beef and cabbage. And I’m not even a big fan of the stuff. Why would I choose corned beef and cabbage when there are so many other wonderful cuisines to choose from? It’s because of the love. I was visiting my Mother and her husband Jim in Virginia on St. Patrick’s day in 1975 when Jim set to work on a project he’d been wanting to try out for a long time. He had been talking about it all week. Jim was going to make his first pot of corned beef and cabbage. It was a joy watching him prepare the vegetables and marinating the meat. He did his very best to coax this difficult dish to perfection. Let me tell you, from start to finish, it was a whole lot of work. That was the first time I ever tried corned beef and cabbage. And I found myself grateful for his efforts. You know you are loved when someone cooks all day, and then invites you to sit at their table. Eventually, my Mother took over the cooking of the corned beef and cabbage. Jim was the lucky one because he was the taste tester for the next thirty-five years. Never leaving her side, he oversaw her preparations which no doubt ensured the dish’s success. 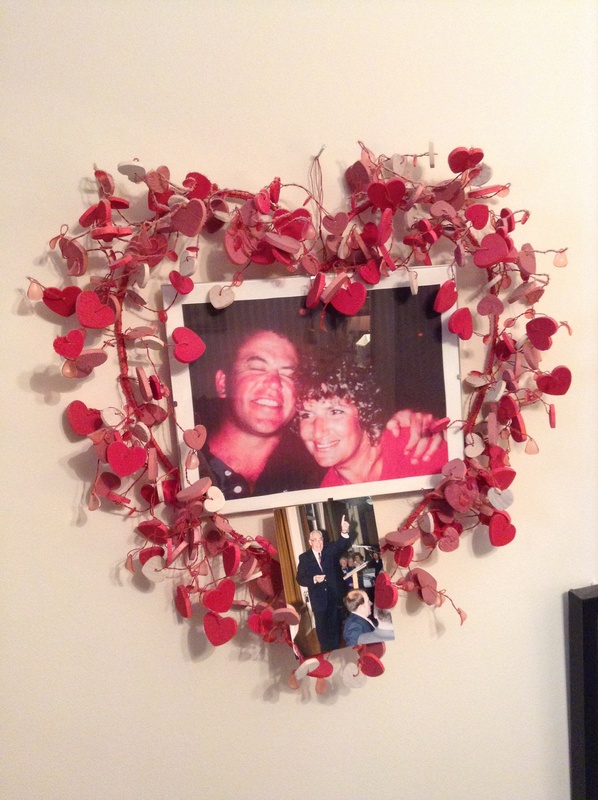 After losing Jim in 2010, corned beef and cabbage became my Mother’s favourite food as each bowl she ladled out was full of memories of the time they spent together. Each time that I visited her in the past five years, she would always prepare a pot for me. She would begin to prepare it long before my arrival at Burlington Vermont’s Airport, by purchasing only the best cut of beef possible. Once I was there, we would purchase fresh vegetables at the market. The next morning I would wake to the smell of coffee and the sound of the cabbage being finely chopped. All day, the aroma of the bubbling brew in the pressure cooker would drive me crazy. The last step of Mother’s meticulous preparations involved melting butter and infusing it into the broth. Happy St. Patrick’s Day, dear friends, loved ones and readers. I don’t know why, or where, or when, but sometime yesterday the word “Crepe,” popped up in my head after decades of lying dormant in my memory banks. As I pondered this word, the most pleasant of childhood memories swept over me. I mentally time travelled back to my 6th year, and am being shown how to make a crepe. I don’t remember who was showing me, but I believe it could have been one of many, for indeed making crepes seems to have been a family favorite. I have distinct memories of being coached by my mother, father, grandparents and aunts. There I was, barely tall enough to see over the stove-top and staring anxiously at the frying batter as it sizzled in the pan. This was one of my first lessons in patience as I was sternly instructed to wait until the edges were faintly brown, and the middle had turned bubbly. Then, and only then was I allowed the fateful flip. Once the crepes were ready, we would all sit down to finally eat. Now, I was to be confronted by the most important decisions a child could make. Would it be syrup or fruit? My first instinct was to reach for the syrup. However, I watched as the adults around me were reaching for the jam. With a spoon they would slather a thick coating of red goo over the entire crepe then proceed to roll this into a fat, plump, roll of sticky sweet goodness was almost too much for my young senses. As all these memories came back to me I deemed that today, there would be crepes. Having bragged to my daughter that I was making crepes since I was six, I was a little nervous this morning as I began my endeavor. On her part, in anticipation of my making crepes, Jen had purchases three peaches, and this morning fried them in a bit of butter with lemon zest & sugar. Using a recipe found on allrecipes.com I mixed the ingredients and went to work. By the time I poured my third crepe, I was feeling like a six year old again. Before long, I was carrying a neat little pile of crepes to the dining room table where I found Jen and our two dogs waiting to be fed. Happily, we all agreed that the crepes were a success. Why did I wait so long to do this?